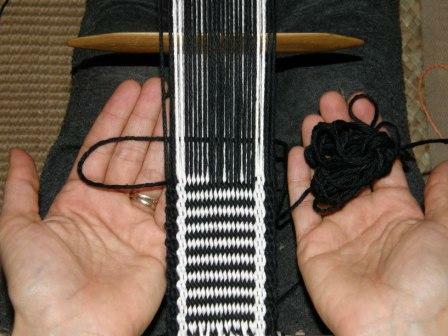 The simple warp float technique is one of the easiest patterning techniques to execute on warp faced weaves. It can be applied to both small and large pieces…from hatbands to place mats…covering the entire woven surface on a bookmark or used as a small accent on larger piece like a table runner. 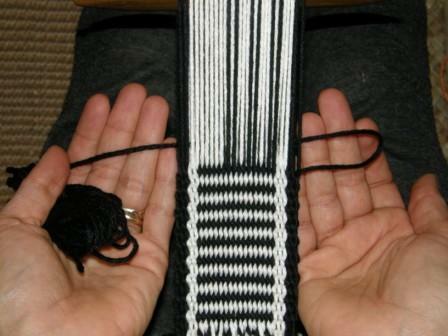 For this technique, you need to be able to set up a warp to weave horizontal bars in two colors as shown below. Instructions for setting up a warp for horizontal bars are on this page. 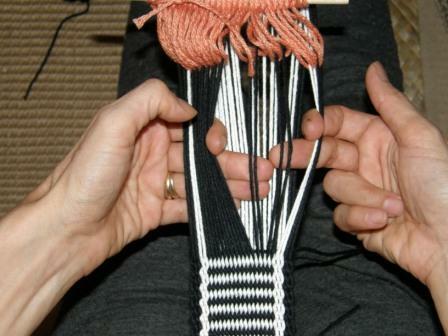 The following step-by-step photos show how to weave the first two sets of warp floats to form a simple triangle. This warp has 16 warp revolutions (32 ends) and, therefore, 8 pairs of warps with which to form the designs. 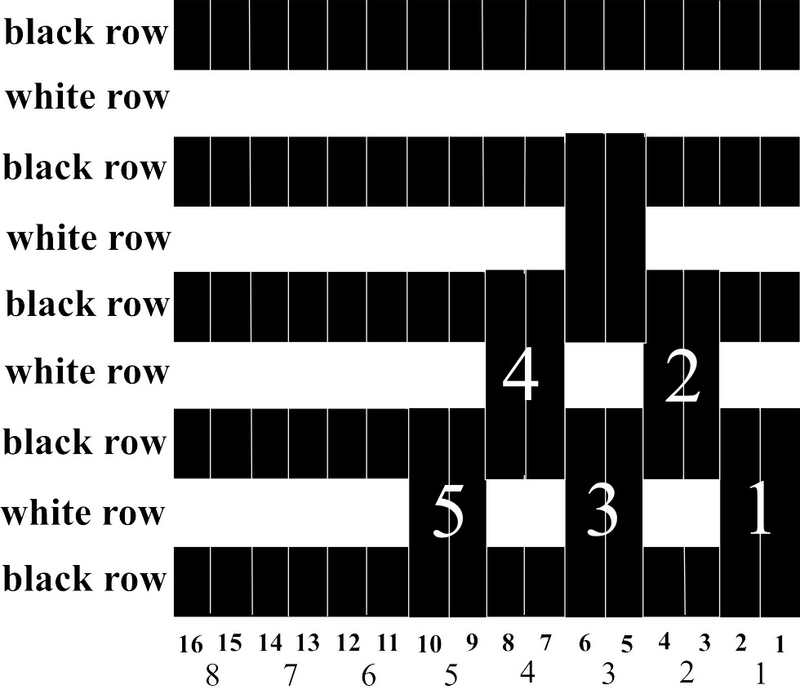 The chart shows 16 warps or 8 pairs of warps with black floats on a background of black and white horizontal stripes. After passing your weft through a shed of all black warps, leave the shed open and select the pairs of warps that you would like to have floating. In the chart above you can see that we want to select pairs 1, 3 and 5. Here I am selecting the first pair of black warps and passing it to my right hand. The second pair on my left fingers will be dropped. 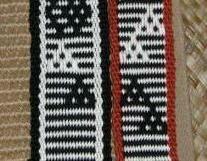 I will continue to select the third and fifth pairs and drop the rest of the black warps as well as the borders. I have selected pairs 1,3 and 5 and saved them with my beater. Now I will open the shed with all white warps to weave a white stripe. What we need to do is ADD the three selected black pairs of warps to the shed with all the white warps. To do this, place your finger in the shed with all the white warps as shown and tilt the beater. This will create another shed below into which you can slide the rest of your fingers. Take out the beater and place it within this new shed. Beat, prop the shed open and pass the weft. Open the shed with all the black warps, beat and pass the weft. According to the pattern chart, you need to select pairs 2 and 4 for the next part of the triangle pattern - these pairs sit between those that were previously selected. Save them with the beater, add them to the shed of all white warps, beat and pass the weft. Open the shed of all black warps, beat and pass the weft. Then select pair 3, add it to the shed of all white warps, beat and pass the weft. This will complete the triangle design. 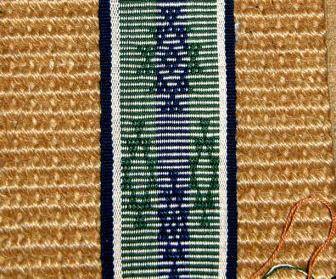 You can weave staggered triangles with this warp set up or weave a triangle and reverse the design to make a diamond. Different arrangements of simple triangles can create new designs. After weaving triangles, this is a good second pattern. The numbers of the pairs to be selected are marked on the pattern chart at right. 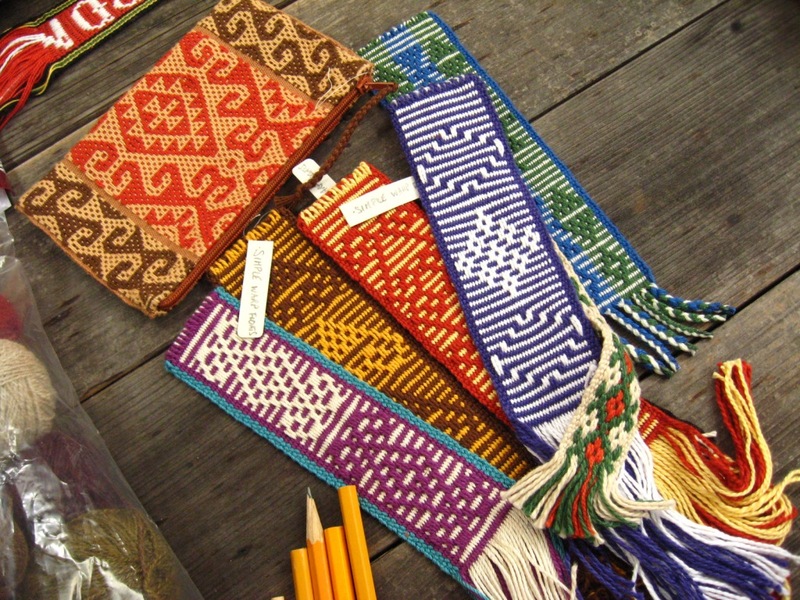 This design is woven into the cotton saddlebags of the Santa Elena Peninsula in coastal Ecuador. The twin bird design with the tree can be seen at left. 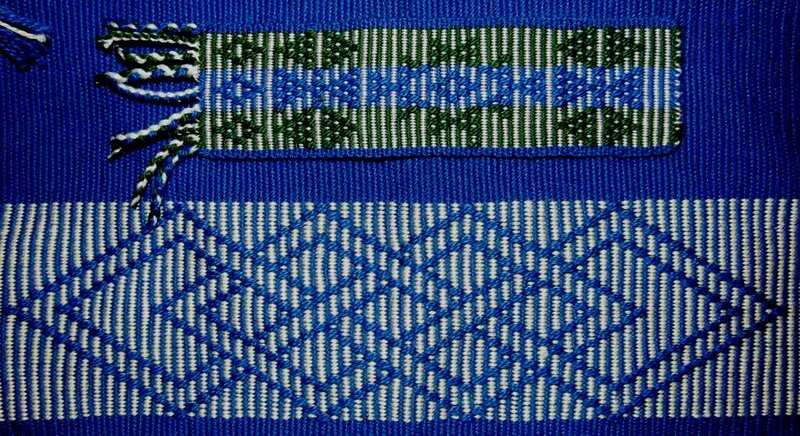 Below it is a rose motif which is woven into the saddlebags of Manabi province also in coastal Ecuador. 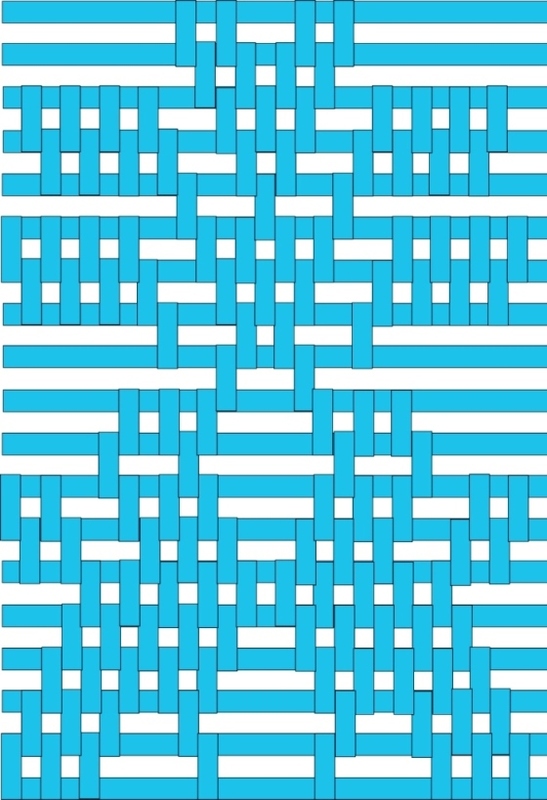 Each blue block on the chart represents a pair of warps although you can weave any of these designs floating single warps rather than pairs. Using pairs, however, tends to make the designs stand out more. At left you can see the difference in the design woven by floating single warps below and by floating double warps above. 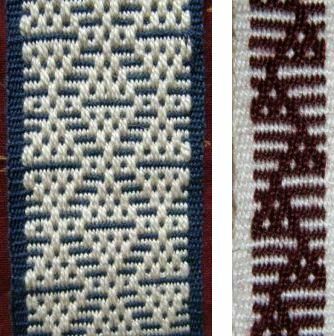 These have been woven using the same pattern chart. Other pattern charts can be seen here. Play with this technique and invent your own designs. I just discovered your site…and wow! It was such a revelation, mostly because you do the kind of weaving that I LOVE. In the past, I hunted and hunted for books and articles with these type of native/primitive and geometric designs and have only found a few here and there. Because of this deficiency, I let my weaving go–for years. Seeing these designs is like a shot in the arm. I’m raring to pick up my loom again. I’m planning on getting your book and I’ll be following your articles online. Since I like the rigid heddle (and am adding another heddle), I hope to do you designs on it. Any suggestions you have which can help me adapt these designs to it, would be appreciated. Thanks again for re-enthusing me for this wonderful craft. I am glad you have found useful stuff on the site. Basically you wind a continuous warp and lash it to your rigid heddle loom. 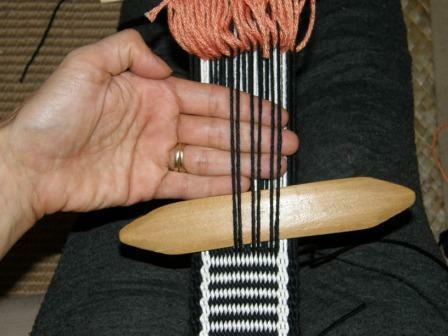 You won’t use the rigid heddle but rather continuous string heddles and a shed rod. I put a piece of piano wire or coat hanger wire through the end loops of the warps and tie that to the warp sticks on my Ashford rigid heddle loom. First , i just want to say that your site is amazing! !Thanks a lot!! I tried a couple times and it works ! But i just dont know how exactly finish my project…. Can you explain me this in details please? A big big thanks again ! I really appreciate it ! Oh ! i almost forget…for the heddle strings…Do you have some tips to keep my threads clean?It came quickly used…it comes hard to work with….it mix with strings on both sides :S They “glue” together! About your string heddles. I wonder what kind of yarn you are using. If it is not smooth enough you will have problems with your heddles but this problem is common for beginners even with smooth yarn because you are probably scraping your heddles too much along the warp when you are opening the heddle shed. 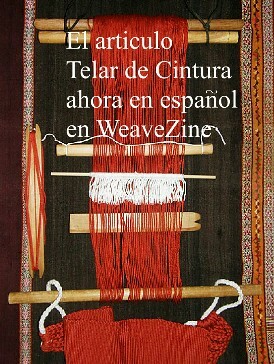 Watch my videos on WeaveZine and try not to move the heddles at all when you are opening the shed. They should move up but not move along the warp. 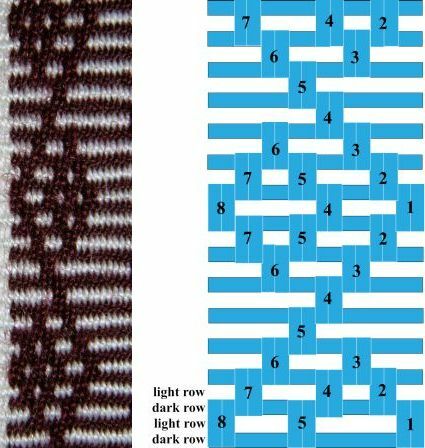 As for finishing, you can sew across the end of your weaving and then cut your warp and have a fringe or you can braid the warp ends. I just sew by hand and try to make the stitches as invisible as possible. There are videos on Youtube about “hemstitching” which is a nice way to finish. You must do this while the weaving is still on the loom. Just google “hemstitching” and you will find it. I am sorry but I don’t understand your questions about the warps being attached together on a big project. Maybe you can send me the link to the pictures you are talking about and I can help you. Thank you for your nice comments and I am glad you have been having success! 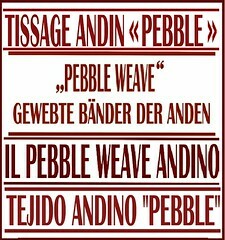 I have been looking for a good video of pick up weaving and found yours. Thank you very much. Thank you for your videos. I use a paddle tape loom making stripes. Doing no other weaving, I just could not wrap my brain around how to do pickups. You made it so easy to follow in the charts and videos.. Decide how long you want your project to be and multiply that figure by the number of ends needed for the pattern you want to weave. For example, if the project requires 36 ends (18 revolutions) on a warping board where the stakes are spaced 36″ apart, you would calculate 36 x 36″. That would give you the amount needed for warp. I have never measured weft and just know how much by winding a ball of yarn that simply looks “right”. Sorry that I can’t be more precise about that part. Firstly let me thank you for make me dream came true. There was a book I read when I was a little girl, it was a bout a weaver girl, whenever she upset or happy, she put her feelings in her weaving. After I read that book and I really really wanted to know how to weave. 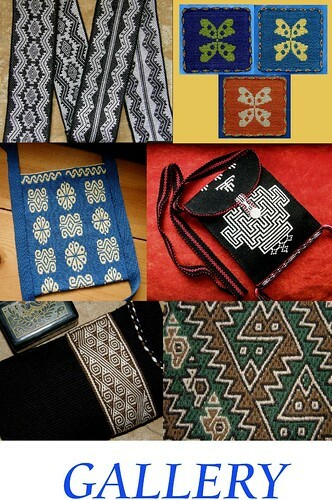 When I became teenager, my family moved to Mountain part of Burma ( I am originally from Burma), then I found out that my next door neighbor did the weaving for shoulder bags and shawls. She taught me how to weave. Then I left the country and I was busy in my new life. But there was always a dream that I am weaving my feelings. When I settled in Australia, I tried my dream again. I was so sad that I forgot how to weave. what I learned when I was a teenager was dream in my dream. I was so disappointed with myself and always looking out for weaving things. One day I decided to surf around in internet because someone told me you can find out almost anythings in there. Here you go. I FOUND YOU LERVENE. I learned and practice every day how to wind, wrap and weave. Its been 2 weeks now. I know how to do beginner weave now. I like to buy your paper books, e books. please sent me a link to do about that. Now I have question, I can’ do how to do simple wrap floats. I can not open part 2 of your video. its something wrong. Can you please help me I you have video on instructions too. I read of you that you are from Australia. I live in Sydney now. Thanks you so much Lervene. Emerald, thank you so much for writing. I see now that you have managed to buy the books. 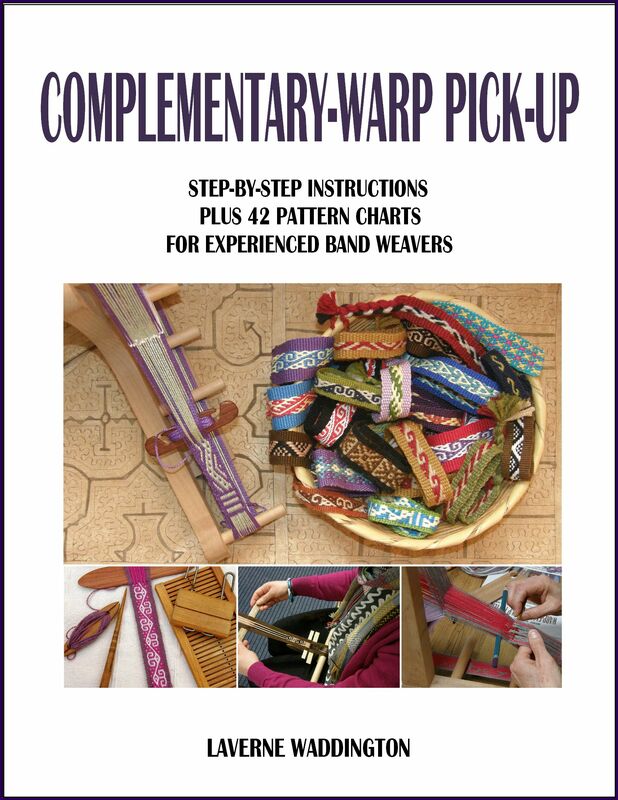 These are for people who have experience with doing pick-up patterns on the backsyrap loom. 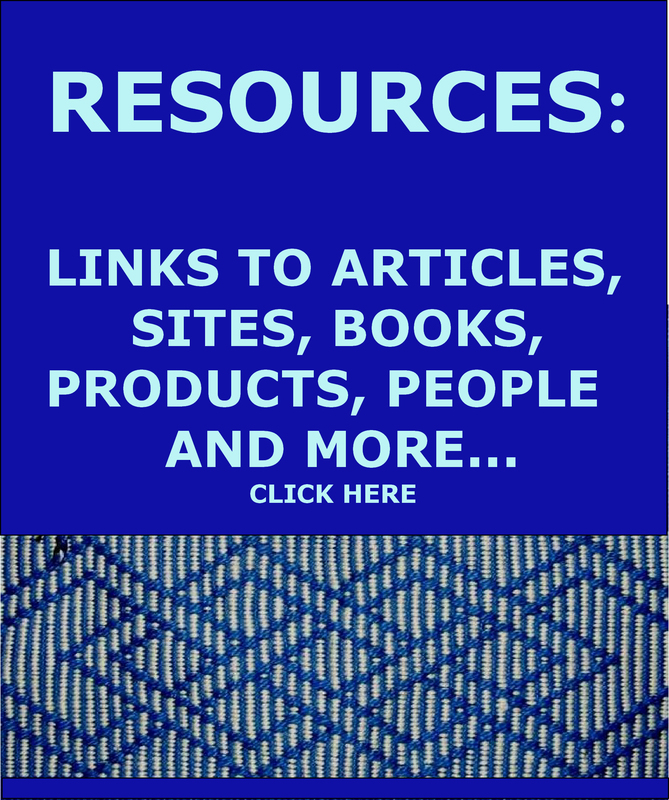 You shoukd try the free tutorials on my blog before you attempt the instructions in my books. Save those for later.Thank you for sharing your story with me. I am so happy for you. Take it slowly, step by step, and do not try to jump too far ahead too quickly. I hope that I will be able to visit Sydney and my family soon, maybe later this year, and perhaps we can meet. I got your email and the link you sent me. I followed the instructions exactly as you said. Thank you so much. I live in Ultimo in Sydney. I will most definitely see you when u come back to Sydney. 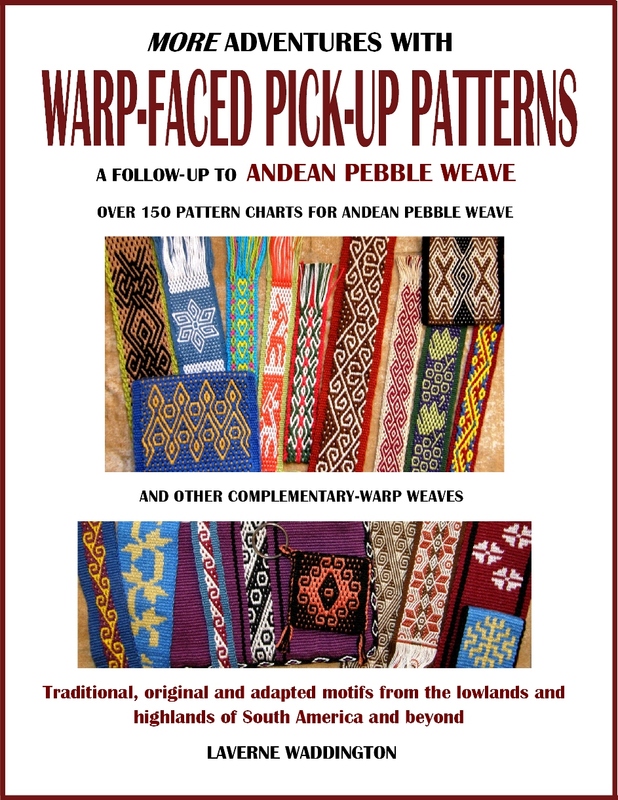 I bought 2 of your books and have been working on some Andean Pebble Weave and Complementary Warp Pick-up patterns. I am getting better and faster! Now I see that maybe I should have started with Simple Warp Floats, so I want to go back and try that. I have looked at your various patterns above. 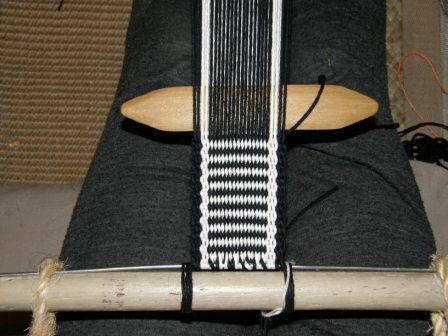 I want to put a warp on an inkle loom. To get the number of ends I need, I think I need to multiply the pattern pairs by 4. If there are 16 possible pattern pairs, I would need a total of 64 ends. Is that right? Hi Christine. The Simple Warp Floats technique in most of the patterns I have provided is a little easier because you don’t have to pick up as many threads for each shed…sometimes just one pair, sometimes two or three. However, I believe that the mechanics of Complementary-warp Pick-up are actually easier. Of the two books you bought (thank you!) that is the one that I recommend starting with. With that in mind, you might take another look at that book. The method I teach in that book works beautifully on inkle looms without having to add extra heddles. As for your question about the warp for simple warp floats, let me give you an example based on the black-and-white band I weave in the tutorial. It has 16 black ends and 16 white ends (32 in total) in the pattern section. I pick the pattern in pairs and so you could also say that there are 8 pairs of each color. You are asking about a band with 16 pairs. So, you would have 32 ends of dark and 32 ends of light giving a total of 64 ends.